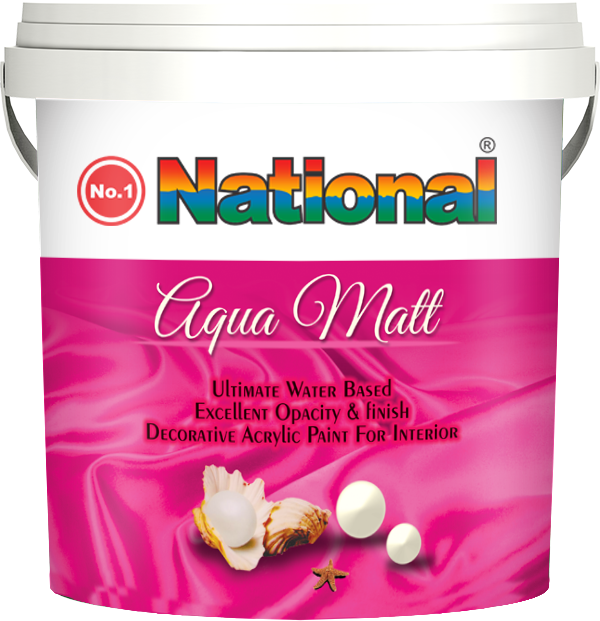 No-1 National Aqua Matt Emulsion is a premium quality water-based paint specially designed to give a luxury smooth finish to interior masonry surfaces, brickworks and wallboards. It is a highly washable emulsion. Its fungus resistance properties, smooth finish and long lasting colours make it an ideal choice for interiors. Bare masonry surfaces should be completely dry and free from dust, dirt and grease. Use a bleach solution to treat the surface affected by fungus. Apply No-1 National Acrylic Primer and allow thorough drying. Sand and dust off. Smoothen the surface by applying 2-3 Coats of No-1 National Filling Putty. Sand and dust off thoroughly. Allow all the surface to dry completely prior to painting. Avoide paint if the moisture content and alkalinity of the walls is still high. Loose and flaking paint must be scraped off. Defective areas should be sanded and smoothened using abrasive paper or wire brush and dust off. Primed with No-1 National Acrylic Primer. Fill the surface with No-1 National Filling Putty if Necessary. Masonry work is recommended to repair large cracks and holes. Allow to dry thoroughly. Prime with No-1 National Acrylic Primer. Fill with No-1 National Filling Putty. Scuff to make smooth and dust off thoroughly.